The Black Bears enter the America East playoffs with home-court advantage as the league's top seed. 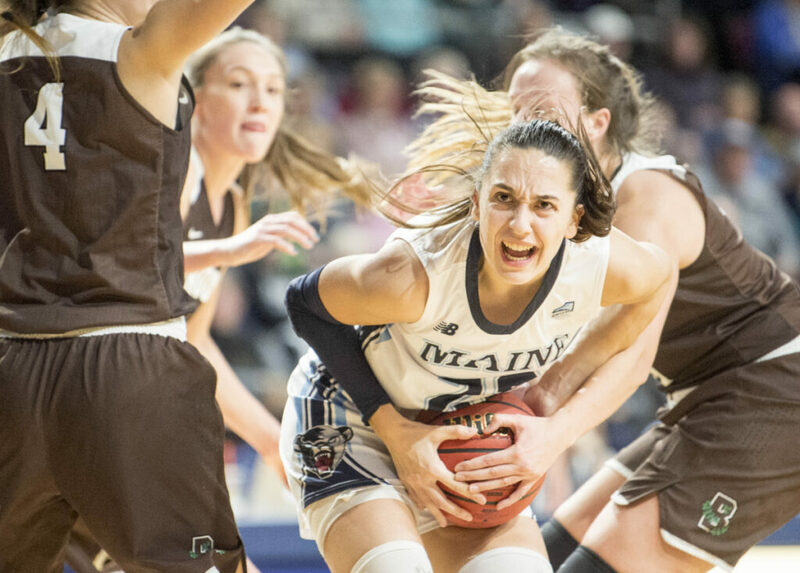 The University of Maine women’s basketball team entered the season as the team to beat in America East. Nothing has changed in four months. The Black Bears (22-7, 15-1) are seeded first in the America East playoffs, which begin Wednesday with quarterfinal games. Maine will play rival New Hampshire (6-23, 3-13) at 7 p.m. at the Cross Insurance Center in Bangor. Last year, Maine won the America East playoffs – and its automatic bid to the NCAA tournament – for the first time since 2004. This time around, the Black Bears will have home-court advantage for all league playoff games and they are welcoming the challenge. Millan was named America East Player of the Year and Defensive Player of the Year on Tuesday, just the fourth player in league history to win both awards in the same season. Millan, who led the league in scoring (17.6 points per game) and steals (2.8 per game), was one of several Black Bears honored. Amy Vachon was named Coach of the Year for the second consecutive year. Senior guard Tanesha Sutton was selected to the first team along with Millan. Senior guard Parise Rossignol was named to the second team and sophomore point guard Dor Saar to the third team. The Black Bears led America East in scoring (67.2 points), field-goal percentage (43 percent) and assist-to-turnover ratio (1.44). They took more 3-pointers (715) and hit more 3-pointers (239) than anyone else, averaging a league-high 8.2 per game. Rossignol, the Van Buren native, is often guarded by Millan in practice. Although Maine has beaten New Hampshire twice this year – 67-46 on Jan. 2 and 69-45 on Feb. 32 – the Black Bears won’t take the Wildcats lightly. Being at home, where Maine was 10-1 and averaged a league-high 1,700 fans, gives the Black Bears an emotional boost. From 1998-2016, the championships were held on designated campus sites. The last two years, the quarterfinals and semifinals were held at Portland’s Cross Insurance Arena, with the championship game at the highest remaining seed. America East switched to the higher-seed format this year.